I know we still have a full month before we flip our calendars over to the New Year — but since I like to get a jump start on things, I ALWAYS have my new planner ready to go several weeks (maybe even a couple months) before! For the past 2 years, I’ve ordered my planner from Personal-Planner.com. I’ve always gone with the “A5″ size — basically 6″ x 8”, and the size the works best for me. However, they have 4 sizes to choose from, so I’m sure you can find one that works for you! The “personal planner” is exactly like it sounds — personalized to fit YOUR tastes, style, and needs. I’m honestly not sure why other companies haven’t thought of this before — but I’ll definitely keep my business with Personal Planner as long as they continue to allow me to make various changes and tweaks so my planner fits my needs. Personally, I need to see one full week at a time. I also prefer all my days to be vertical columns — but you can customize the day/week format in many different ways. I am also quite particular about how each daily column functions. I keep the top half of the column line-free to scratch in various dr. appointments, upcoming meetings, holiday parties, vacations, or anything else I’m scheduling in advance. Then, the bottom half of each daily column is lined — creating the perfect place for my daily to-do lists (which I make the night before). There is plenty of blank space at the bottom for random information, reminders, weekly tasks, or even to jot down a few items I need to buy. 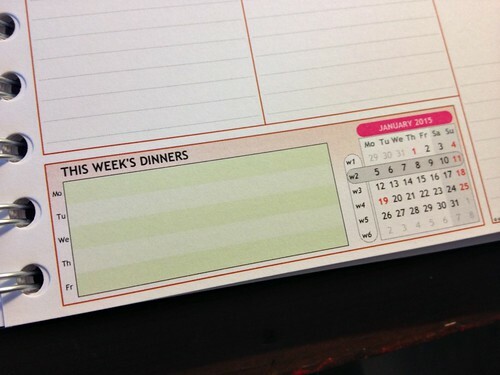 And one of my FAVORITE parts of this planner is the section for our weekly dinners. 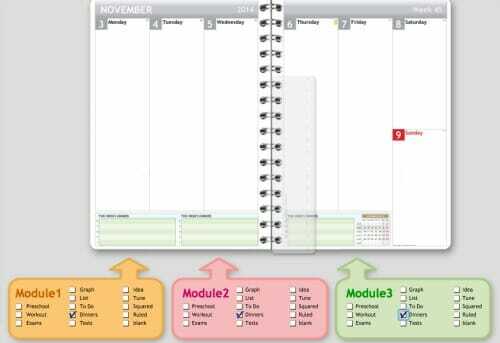 Again, this is all FULLY customizable — so there is no need for you to include a meal planning part to your planner. However, for me, it makes perfect sense and it’s SOOOO handy. I only plan our dinner meal, so I only need a small amount of space. However, if you plan all 3 meals a day, you could use 3 customizable “modules” at the bottom to plan breakfast, lunch, and dinner for the week! Another thing I’ve found VERY useful is that the Personal Planner offers two full years of daily scheduling after the first year. So, my 2015 planner has the full 2016 and 2017 calendar pages listed out in the back — which makes planning in advance that much easier. I’ve been very happy with my Personal Planner… especially the fact that since I’ve already designed a couple of my own planners, my 2015 planner only took me about 10 minutes to customize before I sent my order in! If you’re more artsy and creative, you can take more time to design your own cover and add more details (like all your personal dates, personal contacts, your address book, etc.) or you can do the bare minimum and use the many templates and simple design tools they provide. They also have a new family wall calendar option that allows you to create individual columns for each family member (as many as you need) — and then color-code those columns and even add pictures of each person! Since both our kids our really small yet, I don’t have a need for this — but I can’t tell you how awesome this calendar would have been when I was growing up and my sisters and I were all involved in various sport, school, musical, and church activities. I almost ordered a wall calendar for Dave as he thought it might be helpful to use each column for each of his different classes. He thought this might be a helpful way to keep everything organized… but then we decided to just wait until the start of next school year to give this a try. 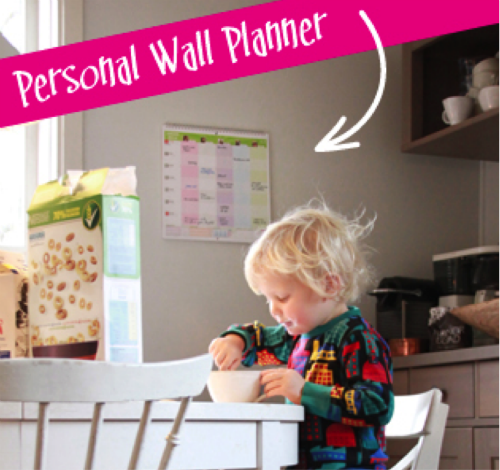 This planner and/or wall calendar would be great gift ideas (at least in my opinion!) or a nice little treat for yourself — especially if one of your New Year’s goals is to get more organized! Today, two lucky readers will win a Personal Planner voucher — good for a free planner or wall calendar of choice! NOTE: If you need it by Christmas, you’ll need to place your order by Dec. 7. To enter this giveaway, simply use the Rafflecopter widget below. This giveaway ends at 11:59 pm EST, Sunday, 12/07/2014 and is open to US residents, 18 years or older. The winner will be randomly selected via Rafflecopter and notified via email. I received a duplicate prize package in exchange for hosting this giveaway — all opinions are 100% my own. Please see my full disclosure policy and contact me with any questions you have. Good luck! I'm Closing Down My Blog... for 2 Weeks! Hope you had a wonderful holiday! 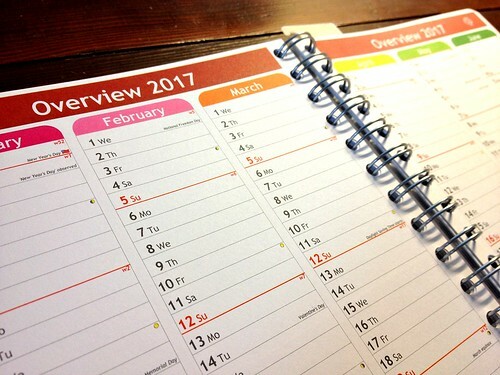 Question: I purchased the personal planner and love it, however, I am bothered that there is no monthly calendar view. I try to plan from my monthly schedule and break tasks down into weekly and daily manageable pieces. What are your thoughts? 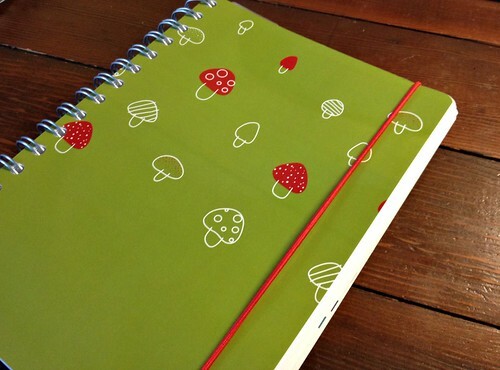 Also, do you use a separate planner/notebook for managing all your blog work? I currently don’t use any other planning tools except my planner — and maybe a few sticky notes every now and then. I do all my personal and work stuff in one planner as that feels like the simplest option for me right now. comfortably, I can write in it, the mean planner is great, I just wish it included Saturday and Sunday but all in all I love it. Thank you Andrea for bringing this gem to my daily hectic existence. Too bad! I ordered mine already over a month ago (when I saw an older post of you mentioning this site). 🙂 But I’m very pleased how it turned out, and this even in german! I use a weekly paper planner, too. I will have to check this out! Awesome! I have four kids and this would be perfect! This looks like a really neat planner. Thanks for sharing and for the opportunity to win. I can’t get the rafflecopter to work. Any suggestions? New year to start organized..nice. Hi Katie, the planner is about 3/4″ thick, but there are a BUNCH of blank pages in the back that you could rip out to make it thinner. As for the front cover, it’s very thin… BUT it comes with a very thick plastic (see through) cover in front of the decorative cover. Does that make sense? 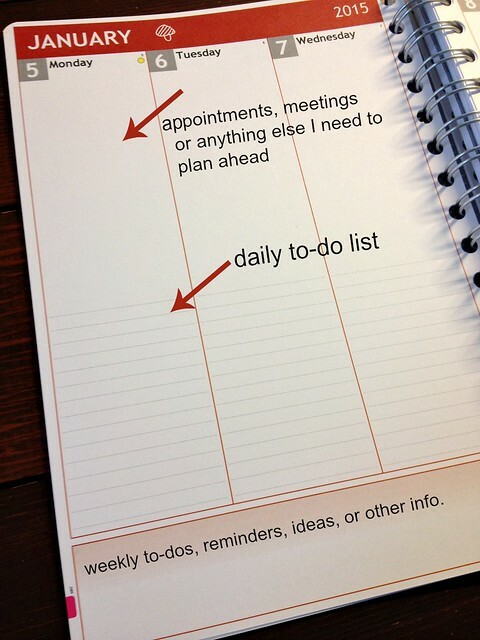 So do you still use your daily docket along with this planner? Just wondering because I love the daily docket too! Good question Karina! I actually don’t use the daily docket anymore just because I can do pretty much everything I need and want to do with just the planner. This way, I don’t need to print extra documents or have extra papers lying around. However, if you have a good system working for you, I’d encourage you to keep using it! 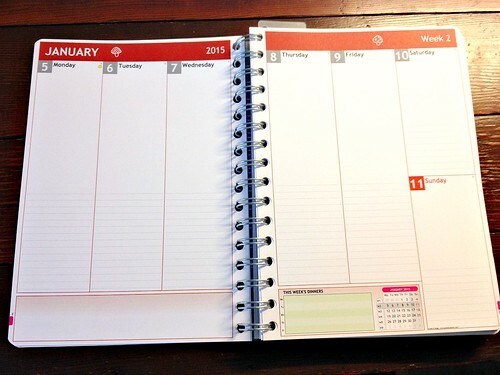 I hope to start 2015 more organized and this looks like it would get me started in the right direction. Thanks for the giveaway. Andrea, Thanks for this giveaway! 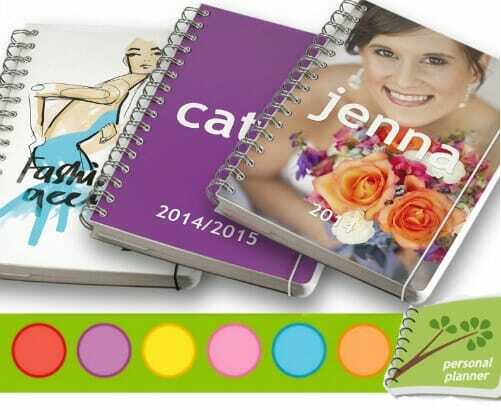 There are so many options I can see why you like this planner. Making one of my own was a lot of fun. I love too be more orangized! I found a planner at Sam’s Club a few years ago that works perfectly for me. It’s the same size and layout as yours, but each column has a big rectangle (smaller than the one pictured) at the top and the bottom part of the column is divided into 5 squares. The top rectangle is for my stuff and my husband’s and the bottom boxes are for our 5 kids’ schedules. Each child has a row based on their birth order. Every other row is shaded so it’s easy to follow across the page. It’s perfect because I can see everyone’s schedule all at once. wow — that sounds perfect for your family and your needs! Thank you for the ‘heads up’ about this product. Is your Rafflecopter widget working properly? I’m not getting a message that my entry was recorded. Not sure if it’s the widget of my computer! I thought it wasn’t working either at first. Then I noticed a checkmark and looked under the three horizontal lines where there was a log out option. I’m using an iPad if that helps.